And Mr. Huffman got it right, and early on. A mobile laundry. You guys are getting better and better at this. Here's the description of this behemoth, courtesy "America's Munitions 1917-1918," the official gov't report on munitions production (munitions in this context means war materiel, not just things that go bang). Note the casual unremarkable racism in an official document of Wilsonian America. Laundering was not a new activity for the War Department, since when the war was declared the Government already owned 14 small steam laundries. [Armorer's note: the first one of these was at Fort Leavenworth, located in the building I currently labor in.] Later the Government went into the laundry business on the scale demanded by the great chain of training camps, building cantonment laundries at a cost of approximately $300,000 each. Experienced laundrymen were placed in charge of camp laundries. Through the cooperation with the Government’s insect experts of the Bureau of Entomology, laundering processes were worked out successfully to disinfect all clothing while washing it and to free it from vermin without shrinking fabrics or causing other damage. Government laundries during the war operated 24 hours per day with three labor shifts and cleaned an average of 10,909,850 pieces of clothing monthly, with gross receipts of over $500,000 per month, approximately half of which was profit. One of the most interesting features of laundry activity was the development of mobile laundry units for overseas use near the front. The men to operate these units were trained in a special school at Camp Meigs, D. C. Each mobile unit required a crew of 37 men. The men of the Army nicknamed these special troops the “Fighting Chinamen.” The need of the American Expeditionary Forces for wash-up and delousing stations at the front, so that even troops engaged in battle might have clean clothes, called the mobile laundry- units into being. The first experimental equipment was designed and constructed early in 1918. After that the salvage service produced 50 others, 32 of which were shipped to France. Each unit consisted of a large steam tractor and four trailers, an outfit which on the road made up a train over 100 feet long. The trailers could be placed together in the field to form a building 30 feet long and 28 feet wide, the tractor acting as the power plant. On the trailers were washing machines, wringers, drying machines, tanks for water and soap, a pump, and a dynamo to supply electric lights. One of these plants working 24 hours per day could do the washing of 10,000 men. This unit was designed by officers of the salvage division. Army laundry activity was in charge of three New York laundry-men: J. E. Dann, president of the Pilgrim Laundry, of Brooklyn, and his assistants, William Longfelder, of H. Kohnstamm & Co., and E. D. Tribbett, of the American Laundry Machinery Co. Fascinating little glimpse into the "backoffice of war" eh? Now, here's a larger picture of both the outside and the interior of the Mobile Laundry Unit. No wonder we have problems with mold and mildew in this building...yikes. True. However, it is a good story regarding this miserable building. I suppose it could be worse...we could be in GP Mediums. I better not say that too loud, otherwise CAC might find it appealing. Thanks for this great Whatziz. I always enjoy the study of the "backstory" to events, and especially of the rise of professional staff and logistics since the Civil War. Not that i am not a front-line adventure type, because I am. However, these are great problems to examine and see how the solutions were developed, implemented, and then put to use. So many folks forget about all the little details that go into fielding an army. That's actually pretty interesting. 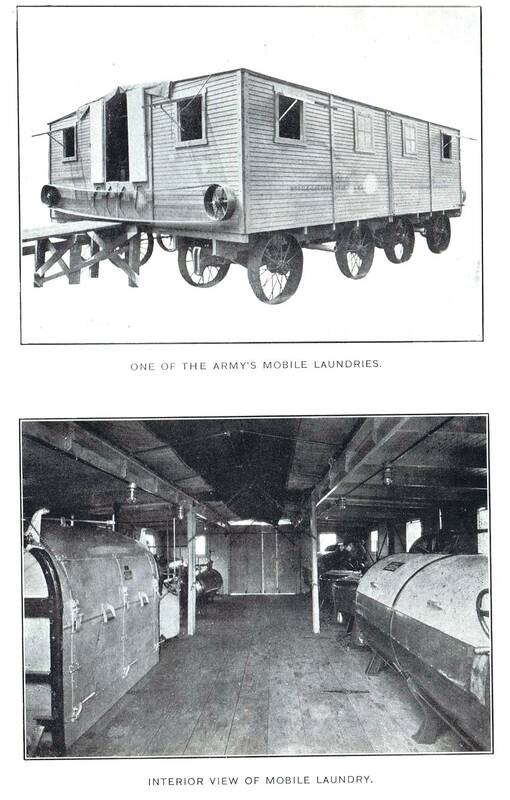 I never realized that the US Army went so far to ensure hygiene all the way back in WWI as to put steam-powered laundry facilities on wheels. I always figured front-line laundry facilities back then were more along the lines of a wash basin and a bar of soap. Although I don't see anything racist about that document. Josh - "Fighting Chinamen" Plays to racial stereotypes. I'm familiar with the "Fighting Irish" stereotype, but is this a case of them being labeled "Fighting" because they're stereotyped as violent, or because they're in the Army? I assumed it was the latter...I've never heard of anybody referred to as "Fighting Chinamen" before, I thought they were stereotyped as being quiet and meek. Oh wait...is the point here that they weren't ACTUALLY Chinese? You're, um, 'joshing me,' right? I was going to comment on the cluelessness of callow yoots, but anything I could say at this point would be superfluous. I remember dealing with the laundry contracts for the unit I was attached to for the Reforger exercises. We would drop off our laundry in individual wash bags designed to be thrown into the washing machine. That wasn’t good enough for the German’s. They numbered the bag, took out the contents, numbered each piece and then separated them into type of clothing, each type being washed differently. Then after drying, they would have a huge sorting table, where the women sorted through the laundry to ensure that each piece went back into the right bag. I not sure how, but it worked with little problem and it seemed to employ a lot of people. I would be invited into the manager office for a breakfast of beer and pig knuckle/sausages, getting back to the unit somewhat tipsy. Those were great days.